Comments on "On The Street.........Those Shoes, Florence"
It might seem a bit too busy with all the stripes, buttons, tie clip, handkerchief, shoe details... but that's what dressing up is all about. This would never work for me, but it is this type of picture that got me interested in your site in the first place. I aspire to this. I love it. Too busy? Nah, I'd add a pocket watch in the breast pocket with the chain hooked in the lapel button hole too. This is a wonderful photo! Beautiful suit. A great example of the English 'City look.' I like the details here, such as the pocket square and tie bar. The dainty two-toned shoes are the only unconventional element, but I think they work here. So much of what we think is 'Italian style' or 'French style' is really English style, albeit cut in lighter fabrics and with a more pronounced flair. I wish more people would dress this way, Fabulous! Love every detail. This is the paradigm of a what the inelegance is: no restraint ,an exorbitant overstatement , too many stylistic details assembled at one time. The typical expression of the actual trend of masculine elegance in Japan that ,in my opinion , is getting complete opposite results. Yes, those shoes... they seem to miniaturize his feet. I want to see him click click'ing away on the pavement. Are the shoes navy/grey? And isn't that tie clip a tad high? Overall, it looks a bit busy...but "nice-ish." I'd expect him to be a touch "closet quirky" should I ever have the chance to meet him and get to know him. there is something medieval about his look and stance, the narrow shoes only add. its actually very cutting edge. Agreed, bilal. Also, the jacket does not quite do it for me. The slim fit is fabulous by far but it looks a little too strained here for my taste, not as effortlessly done as I have seen. He looks very self confident and that is good.His clothes are fine,but to be honest-this picture is not one of my favorites. He looks fantastic. I wonder what time of day this was taken. If he looks this pulled together in the late afternoon, there is no hope for the rest of us. I think the shoes look great for this man (suits a more japanese taste in shoes perhaps?). But overall, I love the way his outfit is nipped, suppressed and pointed out to a crisp and angular perfection. It is rare that you see a man wear a tie clip with a db suit in that way. Bravo! While I am a firm believer that anyone should wear whatever he damn well pleases, some choices may be more successful for one's body type than others. In my opinion, this strenuously turned-out gentleman is simply too short (or not appropriately proportioned) to carry a close-cut long db jacket successfully. The look does not flatter him and the overall effect is somewhat 'munchkinesque,' making his head appear over-large and culminating in those tiny tight-shod feet, though I do find the spats detailed shoes snazzy and unusual. Here is a gentleman whose build might benefit from a touch of Thom Browne's magic jacket-shrinking wand. I believe the tie clip is what makes it busy. But the outfit, as a whole, is very interesting. Great picture! There is nothing negative that can be said about this gentleman. Fantastic. Classic, but still modern, and his suit couldn't fit any better. The shoes...can't quite find the word I'm looking for, but needless to say I'm diggin' them! this guy knows how it's done! Wow! Lots of thought in the details. He seems an illustration. Or a cartoon by Punch, the British magazine. Part of this should be due to this perspective effect, with the upper part of his body larger than the lower one (see the contrast btween his head and his feet). This is so fantastically sharp. I long for the day that I see someone this well dressed on the streets of Seattle. Don't know the guy's height, but I'm guessing that he's in the short side--which, if so, requires rethinking the DB suit. the position of the clip in his tie.......hm...might be a little too high. I would say those are button-boots. Scott, do you have a close-up? Holy button boots, Batman! How wonderfully anachronistic. I love his posture and expression! I also covet a (female-appropriate) pair of shoes styled like that. Tie clip is dispensable. The buttom boots are really a piece worth looking for... Sart can you share with us any clues where to find or order such shoes? Dapper, with a capital "D". Love the tie clip, the tapered pants that accentuate the stance and the sense that he'll be on the go at any moment. Clean, crisp ... and again, the tie clip, which gives the ensemble a touch of play, maybe even whimsy, too. If this is inelegance and too much, then I'm guessing you lean towards the more conventional George W. Bush look. Check your birth certificate- you might not be Italian but American! elegance is something more complex than having beautiful suits, shirts , ties , square pockets and shoes; the way of combining them makes someone elegant and in this process the restraint is pivotal. This means no more than a smart accessory in the context of a sober outfit. 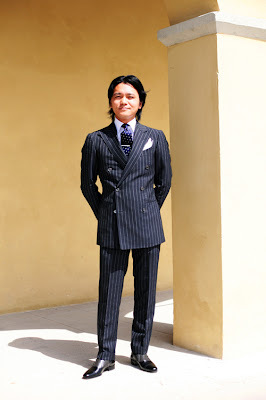 Please give a look on this Blog site to the section "Men in Milan" where You can see some good examples of elegance such as Lodovico Barbera and Matteo Marzotto; the latter has a SB chalk stripe suit very similar to that of the Japanese gentleman in this picture, but the final effect is completely different : a relaxed and natural elegance in the first case and a stiff and puppet like outlook in the second case. I bet he's wearing braces and garthers too. Not a big fan of a tie clip, but beside this he looks dashing in his double breasted ! I love the shoes and fit of the suit but I think the jacket would look better if the rolls of buttons were closer together. a. di t.- honestly, Thom Browne's look really isn't really new at all...most collegiate and continental suits from the mid 50s through the early 60s would exhibit many details of the "Thom Browne" look. His style is very much in the same vein as the Brooks Bros./"JFK" look from half a century ago- which would explain why BB consulted him to design their Black Fleece line...they're trying to offer the cut that they were once known for- skinny lapels, drainpipe pants, exposed socks. In relation to this man, he does have a very classic style. I, being both short and Asian, LOVE 6x2 double breasted suits. Because I err towards 30s and 40s aesthetics when high-waisted full cut trousers were the norm, perhaps I am not completely objective, but I believe that fuller trousers would complement the rather monolithic upper half of his body. There's a very dramatic break at the thigh that creates a "barrel on two twigs" look, which could be avoided with fuller pants that would create a visual fluidity from top to bottom. Interesting, he is almost channeling an Edwardian look. It's very tight and almost overdone, but I think it still easily falls into the category of elegant as opposed to overdone. You are wrong my dear. Also, be a little more subtle in your lie. It's best to sign Genoa, Italy or Genova, Italia and not mix English with Italian variants for place names. It seems that you're not really from where you claimed to be. This guy here definitely knows how to dress and those that say negative things tend to be criticizing not the way he dresses or carries himself but because of his nationality-which is Chinese (probably from Hong Kong from the way he dresses his tie). Most Asian men are in fact shorter than your Euro counterparts. Saying that he does not look good because of his stature is similar to another comment on the Sart's blog where a a tie is commented to not look appropriate on a model of African descent due to the lack of contrast with his skin or something along that line. Let's keep the comments to the clothes and not to racial chracteristics....we all know the those kind of reactions that those comments often lead to. I think the Sart is doing a great job with his blog by portraying the best out of everyone, regardless of style preference or race and I applaud him for that. I am just more than annoyed that people still use racial characteristic as a basis for criticism. I am half Japanese and half French but I look more Asian and I think this guy looks stunning in the DB suit.